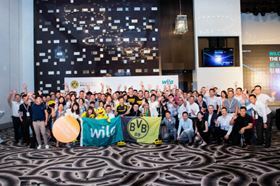 Wilo customers meet Borussia Dortmund players on Asia tour. As a Champion partner of Borussia Dortmund for many years, pump manufacturer Wilo supported the club on its tour of Asia in July. Borussia Dortmund beat Japanese club Urawa Reds 3-2 in their opening friendly and defeated AC Milan 3-1 in the International Champions Cup in China. The game against Urawa Reds was watched by a crowd of 63 000 while the AC Milan match attracted 19 000 spectators. Following the game against AC Milan in Guangzhou, China, Borussia Dortmund players Gonzalo Castro and Lukasz Piszczek met with fans and answered questions from Wilo customers. Even though South Korea was not one of the stops on Borussia Dortmund’s trip to Asia this year, Wilo Korea still got involved. Using the club’s black and yellow colours, parts of the Wilo Korea premises were transformed into a Borussia Dortmund lounge. Wilo customers were able to take part in a special raffle, with prizes including Borussia Dortmund jerseys. This event was also well received by customers. “It’s another area where Borussia Dortmund and Wilo are in sync: we have a loyal, reliable and continuously growing fan base,” said Krumm.